While devising and implementing a technology strategy for a high-tech start up in Finland in 2005 we commissioned a patent mapping exercise from PatAnalyse staff. Initially the assessment of the patent landscape surrounding our product and service concepts gave comfort about our freedom to operate. Later we used the deep understanding we gained of competitors’ patents to guide our own IP strategy. Eventually the patent mapping study carried out by PatAnalyse staff became central to the formulation of our company’s business plan and stimulated a fresh wave of innovation. A well executed FTO analysis provides an accurate and comprehensive risk assessment and can help the client make the right business decisions. It is of crucial importance to carry out any Freedom to Operate (FTO) analysis well, thoroughly, and on time. In the worst case a poorly done study can, at a later date, result in high costs in connection with license fees, product redesign, production stoppage, damage compensation, or even the payment of treble damages for wilful infringement. However, contrary to common belief that even a brief patent search and review can give the client 'an 80% answer', in most cases the coverage of a brief review is well below 20%. 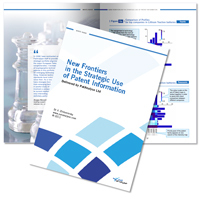 Using revolutionary patent searching technologies, PatAnalyse is able to find many more patents than other service providers and to deliver an intelligent analysis of the details of those individual patents most relevant to the subject area of the FTO study. The extent of the risk from potentially offensive patents cannot be known at the beginning of the study, so to overcome this inherent uncertainty PatAnalyse uses a structured multi-phase approach. The first phase of the study is aimed at identifying the main set of possible offensive patents and begins by building a thorough understanding of the client’s marketing and technical plans. Working together with PatAnalyse, the client's team highlights what technologies, features, and benefits new products should have. Together with the client team we agree a set of bespoke categories for the classification scheme including categories reflecting the different degrees of offensive strength of a patent’s claims. After that, PatAnalyse documents the agreed boundaries of the FTO study and develops the initial search strategy. PatAnalyse prepares written instructions and the initial ‘training set’ of pre-classified patents in order to instruct the project team of subject area experts. Using our quality metric and error correction algorithms we carry out continuous monitoring of the internal consistency of the judgment of each subject area expert and provide further training and instructions if required. We continuously iterate the self-learning patent search strategy and add newly identified patents to the project repository. By agreement with the client team, we keep in the patent repository only patent families which contain actively maintained granted patents or patent applications with specific patent offices - for instance PCT, DE, EP, or US patent offices. Any abandoned, revoked or withdrawn patents are identified using the information available from the INPADOC Legal Database. PatAnalyse continually runs the artificial intelligence relevance score algorithm in order to segregate the most relevant patent families from the patent repository for preferential review by the project team. Typically our relevance score algorithm is capable of identifying more than 99% of all relevant patents without adding more than 50% of irrelevant entries to the patent screening process. This allows us to keep the project budget under control even in when broadly inclusive patent search strategies bring in a substantial number of irrelevant patents. The list of emerging patent documents which are likely to be of interest is regularly shared with the client. Any emerging risks and our recommendations about how to deal with them are first discussed with the client team in conference calls. Written records are created only after discussion with a client. The main deliverable of the first phase of the FTO study is a list of classified patents for a further review by the cleint’s in-house patent attorney team. If the existence of potentially blocking patents is confirmed by the patent attorney, we carry out the next phase of the FTO study in order to find the best way forward. During consecutive separate project phases we carefully determine if potentially blocking patents are valid. We aim to find the prior art documents which have the potential to challenge the novelty of the claims of potentially blocking patents. The invalidity search is carried out using patents filed at various national patent offices including the Japanese, Korean, UK, French, Canadian, Chinese, Brazilian, etc. Using the keyword strategy developed for the first phase of the project we carry out searches in the scientific publication databases - the Web of Science and InSpec. If the invalidity challenge proves to be difficult, we provide initial suggestions for a work-around. Using the deep technical insight into tried and failed approaches we have gained from screening patents during the previous phases of the FTO study we aim to find breakthrough solutions which engineer around the claims of any potentially blocking patents. As a deliverable, we document all proposed ideas and supplement this list with an initial feasibility study for the most promising one. If required by the client, we can identify and evaluate the most appropriate licensing or acquisition targets. Our recommendations are based on marketing intelligence, analysis of the patent landscape and the deep technical analysis of individual patents. All findings and our recommendations at different phases of the FTO study are first discussed with the client's team by teleconference before generating a final report which analyses the risks, identifies all open issues, and provides details of all required follow-up activities.